Climate change is already beginning to affect New York State and these impacts are projected to grow. At the same time, the state has the ability to develop adaptation strategies that will address many climate-related risks, thereby reducing impacts and taking advantage of possible opportunities. 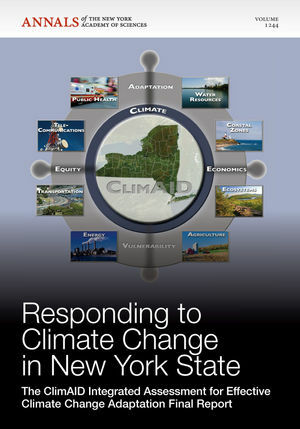 The ClimAID assessment presented in this volume provides information on climate change impacts and adaptation for eight sectors in New York State: water resources, coastal zones, ecosystems, agriculture, energy, transportation, telecommunications, and public health. Observed climate trends and future climate projections were developed for seven regions across the state. Within each of the sectors, climate risks, vulnerabilities, and adaptation strategies are identified. Integrating themes across all of the sectors are equity and environmental justice and economics. Case studies are used to examine specific vulnerabilities and potential adaptation strategies in each of the eight sectors. These case studies also illustrate the linkages among climate vulnerabilities, risks, and adaptation, and demonstrate specific monitoring needs. Stakeholder participation was critical to the ClimAID assessment process to ensure relevance to decision makers across the state. For 200 yearssince 1817the Academy has brought together extraordinary people working at the frontiers of discovery. Among the oldest scientific organizations in the United States, it has become not only an enduring cultural institution in New York, but also one of the most significant organizations in the global scientific community.